Many people write and wonder why we’re not playing their Irish Festival. There can be many reasons but quite often promoters like to change the lineups. Whatever. It’s really important that you support your festival. They are fast becoming one of the great entertainment resources in the USA. With clubs closing down every month, festivals are essential for the survival of live music. If you feel strongly about Black 47 playing your festivals, that’s fine. Wear one of our t-shirts. But support live music! Larry’s essay is quite long so I have broken it up with just the first four paragraphs visible here. Just click on to read the whole essay - it’s well worth it. call from some savvy All-American wondering about his or her chances of pulling off an Irish Festival. And why not! Get yourself a fenced-in space, a stage, a workable PA, a headlining band, beer company support, a volunteer staff, some fine weather and you could be on your way to being the next Milwaukee Irish Fest. Where did it all start? Well, that’s a bit like the Ray’s Pizza conundrum, isn’t it? But my gut instinct is that it all began back in the New York Irish community of the 50’s. Okay! South Side Chicago and Boston, you’ve got documented proof that your festivals were celebrating their centenaries when wide-trousered Galway men and their petticoated dates from Leitrim, Mayo and Tyrone were chastely cheek-to-cheeking to Micky Carton’s Orchestra at the Jaeger House on Lexington Avenue. My theory, though, is that when these young immigrant Irish trooped out to Rockaway Beach on pre-air-conditioned summer weekend and danced and drank in the haunts of Irish Town, that the seeds were sown for the modern Irish Festival. With time, those dancers married, had children and didn’t get out as much. Besides, the urban decay of the 60’s hit Rockaway hard. Most of Irish Town was demolished and the streets were no longer as safe; but the couples still wished to meet, reminisce and show off their kids. So, they unfolded their beach chairs, bought a keg, finagled a couple of hungover musicians to toot their flutes and, before you knew it, they had a rip-roaring block party on their hands. The Rockaway Festival that grew out of those innocent Sunday afternoons was one of my favorites; although, one year I was almost brained by a beer cooler thrown by an appreciative fan. Alas, that festival is no more – our national savior, Mr. Giuliani, put his Puritan kibosh on it by barring the sale of alcohol. And who in their right mind would want to attend a dry Irish Festival? But I digress. A number of veterans of the Rockaway bash who relocated to Southern Florida, Sheila Hynes and Rory O’Dwyer (son of the great Irish American Civil Rights activist, Paul O’Dwyer) amongst others longed for an authentic hooley around St. Patrick’s Day. They hired a park, a PA and engaged Adrian Flannelly to snare some top class musicians. A couple of decades later, their festivals in Ft. Lauderdale and West Palm Beach are still setting the pace and, given the location, they almost always have good weather. shuffled off like six emasculated snowmen, Frank stood there, check in hand (plus bonus) silently marveling the lunacy of certain New York musicians. The Festival now takes the precaution of erecting an enormous tent. You just can’t trust that Lakeside weather. But you can depend on the warmth and rowdy loyalty of the South Side Irish. extravaganza and hit the jackpot with a record-breaking attendance. Of course, when you have built up a reputation like the Milwaukee Irish Fest, you don’t really need a headliner. Back in 1981, the goals of the organizers were modest, hoping in some small way to emulate the successful local Fest Italiano. Now over 100,000 pass through their turnstiles annually. Founded by Chuck and Ed Ward and a loyal, hard-working committee, Milwaukee has become the Mother of all Irish Festivals. 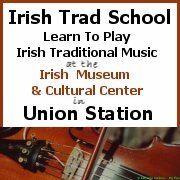 One of their funded projects is the Irish Music Archives; it now contains almost 50,000 pieces of Irish recordings and sheet music. Festivals, of course, reflect the current dynamics of Irish American life. There is the eternal battle between those more attuned to the homeland that cringe at leprechauns, green beer, freckle-faced competitions, and those who see no harm or, indeed, make a buck from such shenanigans. Then there are the various political activists who consider it their right to set up a table on the big day versus those who feel that festivals should be apolitical or that Irish politics ended circa 1916. This has led to friction at many festivals. But now, with peace in the ascendancy in the North of Ireland this issue shows every sign of becoming a memory. Besides, the vast majority of people now feel that festivals are about celebrating Irishness in its myriad forms and the tent is big enough for all. I never cease to marvel at the level of altruism at most festivals. Practically all of the money raised goes to an array of charities and quite often to the construction or maintenance of Irish Community Centers. Volunteers spend many months prepping, primping and preparing for their big weekend; and it’s a rare festival nowadays that does not have its headliner booked by November. Take for instance the Dublin Ohio Festival. Kay McGovern and the Dublin Irish Celebration Committee work with Sandra Puskarcik and the City of Dublin in apparent harmony to run this ever-evolving event. When asked the secret of their success they cited the usual suspects: good location, great PA systems, over 1200 dedicated volunteers and draconian stage management – Kay personally has knocked on the hotel doors of tardy musicians and will not allow any act – no matter how big – to go beyond its allotted time. And where do the profits go? A very equitable split between Irish organizations such as Project Children, cultural and sporting activities in schools, theaters, social groups, with the balance going back into the City of Dublin to ensure that the festival is self-sufficient. Their parting advice to prospective promoters: organize, have some money to spare and be prepared for every possible disaster that might happen, because it eventually will. together and celebrating heritage. In a society that becoming ever more TV addicted, white bread and homogenized, Irish festivals are an affirmation of all the things that make us different. So, you want to start your own Irish Festival? Just get a fenced off space, a stage, a PA, a good band, a Mussolini-like stage manager and everything Irish you can think of – except the weather. Maybe I’ll see you there this summer. This entry was posted on Thursday, July 20th, 2006 at 12:03 am and is filed under Black 47, Festivals. You can follow responses via my RSS 2.0 feed. Both comments and pings are currently closed. great article, and dead on! fetivals and venues that support live music are the lifeblood for any scene, without places to perform it gets very discouraging being a musician! so get and show yer support folks, the music isn’t going to play itself after all…. now i just want a second article for aspiring musicians on how to get booked at those festivals!